There are two types of shields that are almost universally associated with Roman legionaries. Of the two, this oval-shaped Roman Centurion Shield was favored and used by most centurions and praetorians during most of Romes conflicts and battles. Like most Roman shields, this shield was considered to be a soldiers main form of defense and was sized accordingly, allowing for the shield to defend a majority of the soldiers body and legs from attack, while also allowing the shield to be interlocked into a testudo formation, also known as a tortoise formation or a shield wall (Spartans utilized a similar concept in their phalanx formation). 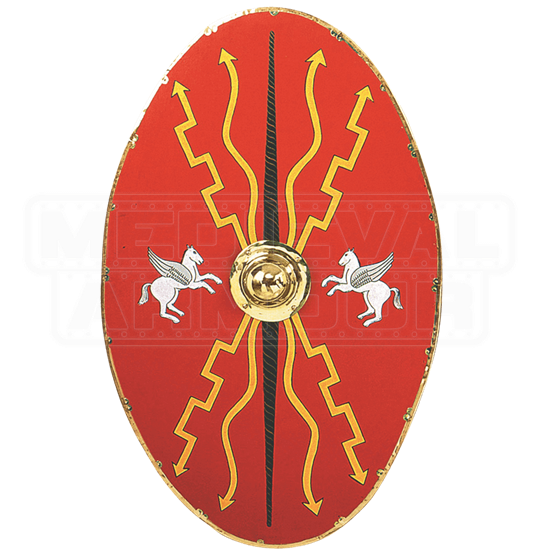 This shield is a broad oval-shape that features a red face adorned with wavy and blocked yellow arrows, as well as white winged horses flanking the sides of the brass metal shield boss. The shield is made from hardwood and features a linen covering, which provides a subtle enhancement to the shields already impressive strength. The shield measures approximately 48 inches tall and 30 inches wide. Depending on your grip and personal strength, you can hold the shield vertically or horizontally, changing what and how the shield handles and defends. 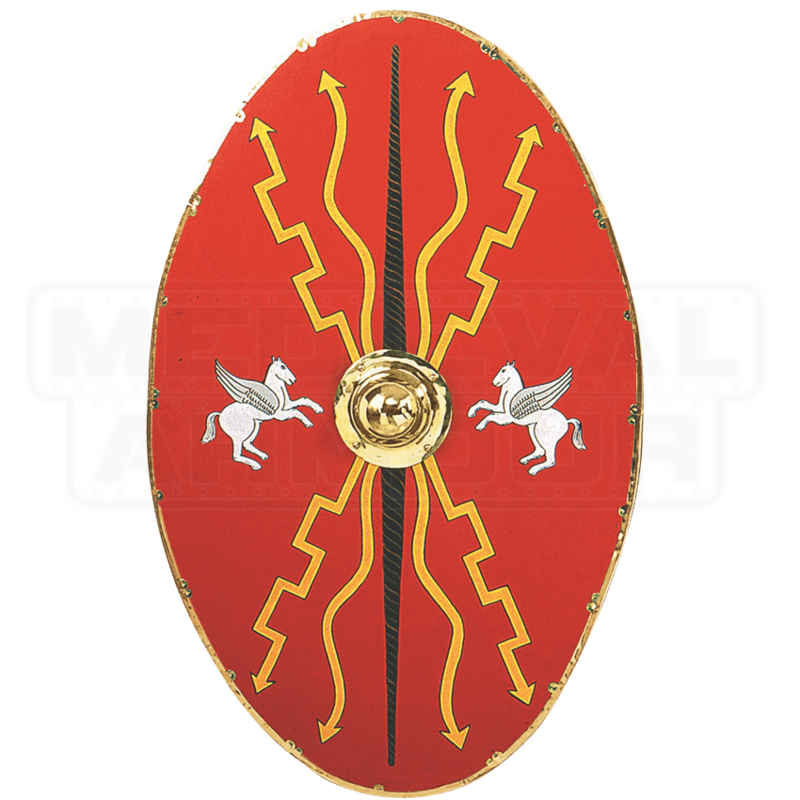 You could not ask for a better shield than this Roman Centurion Shield, especially if you are planning on being a centurion or a praetorian. And even if you are not involved in re-enactments, this shield is still an impressive collectors item and display piece that is worthy of any decor or collection of arms and armour.